“Polish people love culture from the heart. To me it is an amazing country.” That’s what a Spanish friend, whose job in the luxury wine business takes him all over Europe and the world, told me once about Poland. Like a lot of Spaniards, he’s pretty straightforward, always honest and warm, so I sat up and took notice of what he said. A little egg-themed Easter decoration for the table. Crossing in front of Ebisu Garden Place, we walk down the hill to the Embassy of Poland in Tokyo. It is a cool, sunny spring weekend afternoon, with pale reddish purple flowers typical of the season in the Kanto region sweetening the air along the avenue with their scent. As we approach the embassy, Consul Dominika Giordano emerges and greets us with a cheerful “Hello!” We follow her inside, and are met with a wave of roasted meat smells that fill the embassy and feed our anticipation. Led deeper into the building by our hostess, we arrive in a room bathed in daylight from floor-to-very-high-ceiling windows, a wall draped in climbing plants visible just beyond. The sound of trickling water emanates from the garden outside. Inside, at the bottom of a graceful set of spiral stairs, there is a round table with a white table cloth. 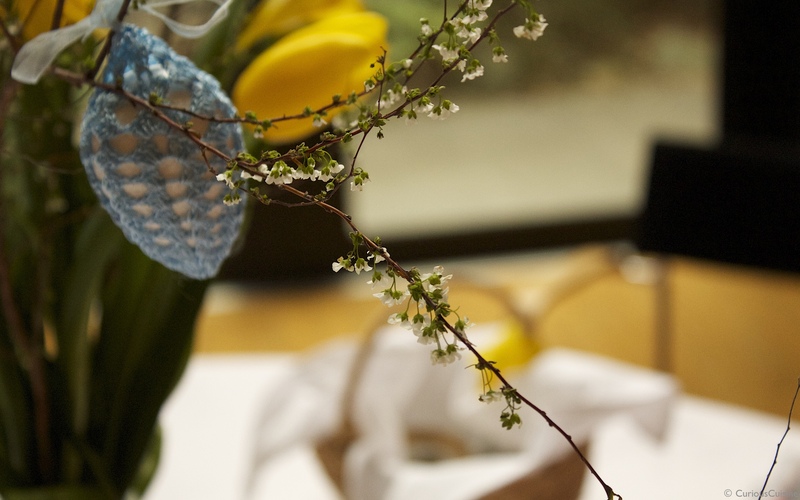 Tall yellow tulips and little white flowers Japanese people call “snow willows” stand in a vase, eggs wrapped in pink and blue crochet nets hanging from the stalks and leaves. Colourfully painted wooden eggs, a porcelain ram, crochet chickens and many puffy yellow chicks sit here and there on the table. There are crayons and water colours, too, to paint on small mountains of boiled eggs. It is such a joyful and lively spring scene. A little basket of goodies called a “swieconka.” Families each bring a basket like this to church on Easter weekend to have the food blessed by the priest with a dash of holy water. Easter is a very important Catholic holiday in Poland. However, according to Dominika it is also very much a folk festival. And certainly, as well as in a lot of other European countries, it is mixed with pre-Christian traditions. The beautiful shawl Dominika is wearing this day has a traditional pattern on it — one of many distinct local patterns across the country. 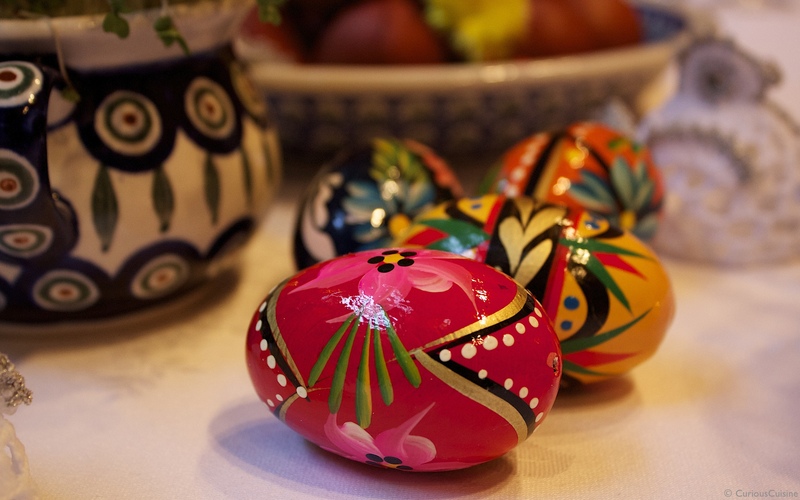 The pretty Easter goods on the table are mostly handmade by local craftsmen and craftswomen, and some contain unique regional patterns as well. The hostess, with a traditional shawl over her shoulders. 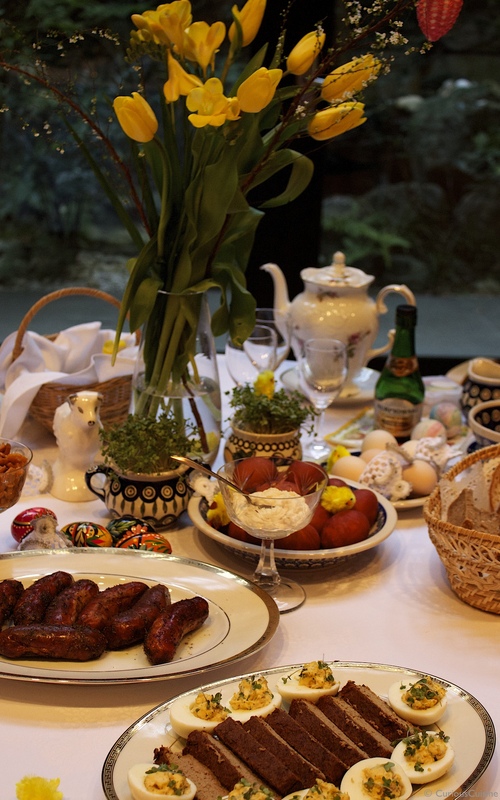 As you can imagine, the dishes appearing on Polish tables for the Easter feast are also made just for this very special holiday. The Polish home dishes Dominika makes are always hand-made and deeply detailed, to a level that both of us have rarely heard of or experienced, and today is no different. 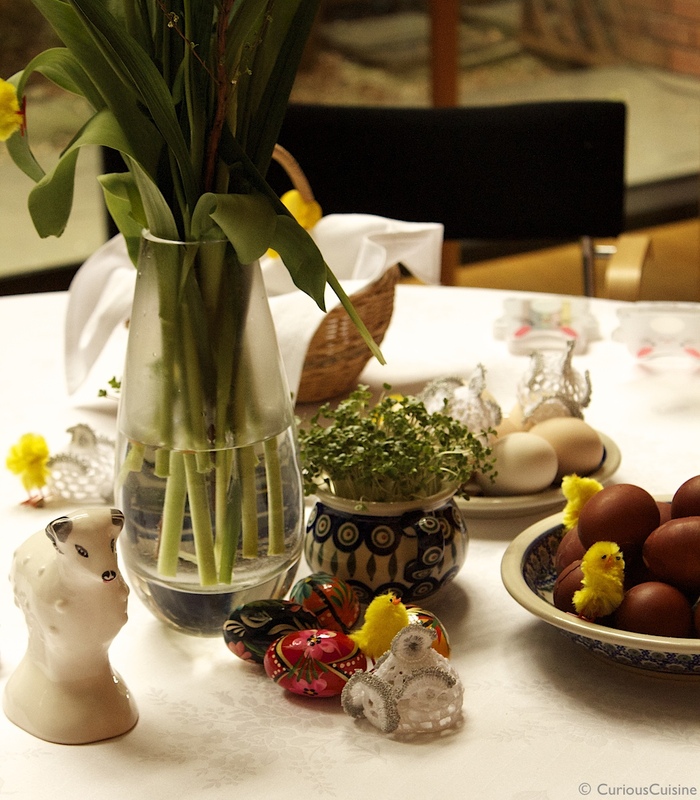 She has put in, we discover, all the time and effort needed to create a genuine Polish Easter meal, and then some. 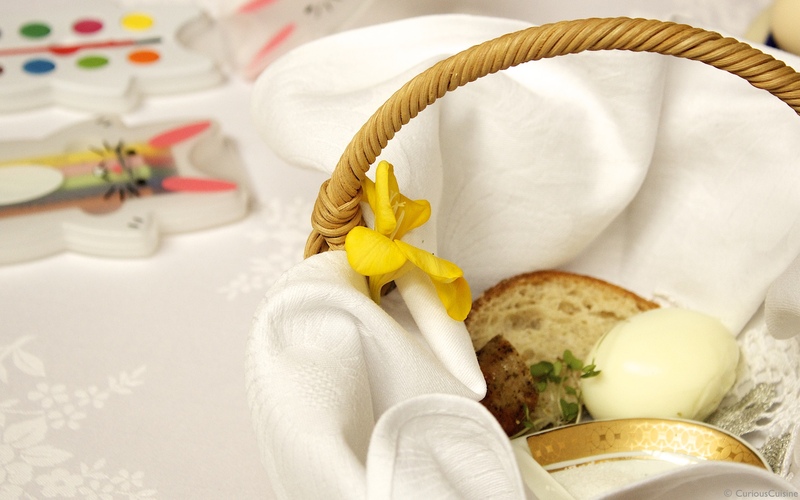 The first dish is biały barszcz, white borscht. What is unique about this soup is the addition of home-made sourdough, which has to be prepared a few days in advance. 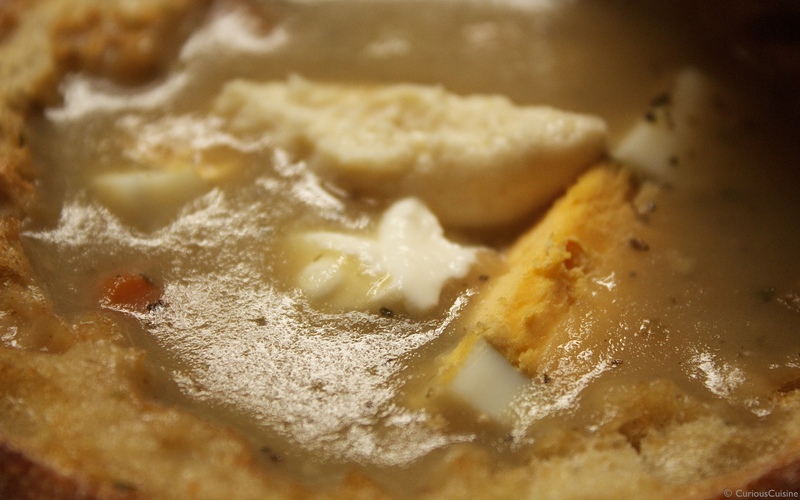 Opening the lid of the soup bowl — actually a round, hollowed out loaf of bread — our faces are suddenly awash in a wonderfully hearty cloud of steam, heavy with the scents of the man ingredients. Mixing the horseradish and sour cream toppings into the thick soup with our spoons, we dug in and tried a mouthful. Biały barszcz white borscht, a Polish Easter specialty. The second dish is roasted white sausages, covered with marjoram. The skin is crunchy and the meat juicy and firm, laced with accents of black pepper and marjoram. As if this richness was not enough, we pair it with brown bread in a heavy coat of butter, for that perfect touch of creaminess. 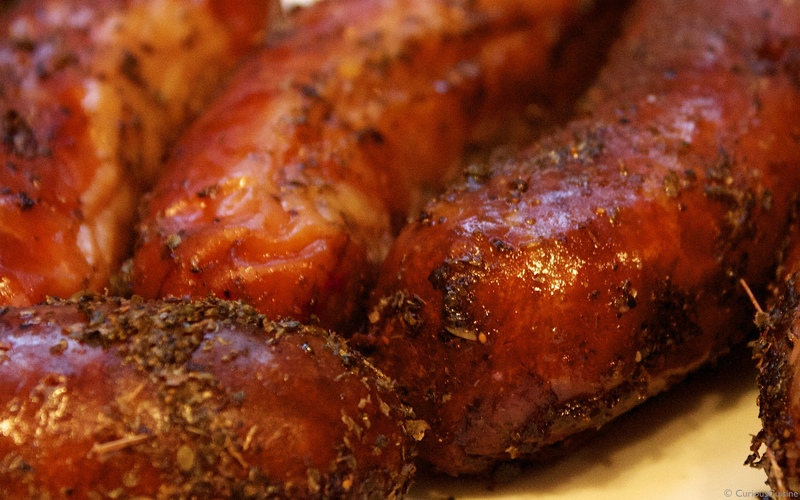 Roasted white sausages seasoned with marjoram. 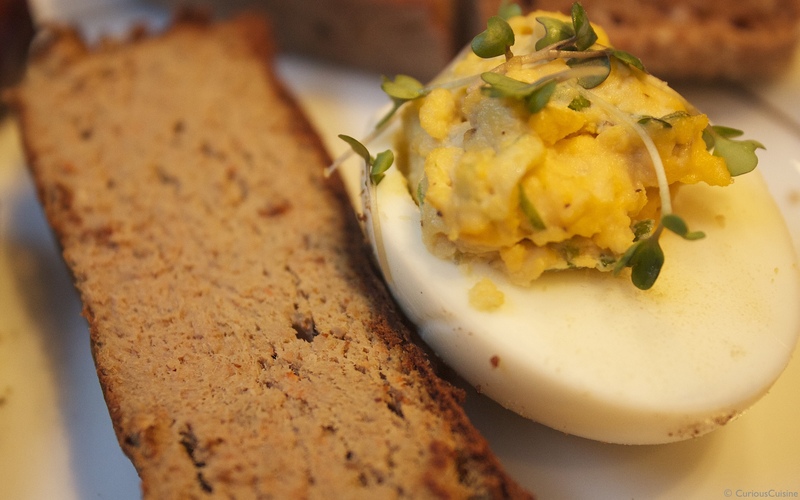 Next, Polish pâté, pasztet arrives on a large plate surrounded by a pretty ring of stuffed eggs. Of course the eggs are one of the main symbols of the Easter, and you can basically do anything you like for the stuffing. The pâté, baked a deep brown and cut into neat slices each about a finger thick, looks deceptively simple. But when I heard how much care and effort went into it, I was frankly stunned. First of all, I’d never heard of a home cook making pâté from scratch, something I associate with the more ambitious sort of restaurant. Then Dominika explains how she made it, starting with oven-roasting four kinds of meat – pork shoulder, rump steak, chicken and liver – for two hours before putting them all through a grinder three times. To this mixture she added marjoram and other herbs, carrot and onion – all flavourful vegetables that contribute their own particular goodness to the whole. Then she added egg, making sure to mix it in so deeply the meat shined, and put the entire thing back in the oven. When the pâté was cooked and cool again, it was ready to serve. Just like the Bialy Barszcz, Dominika tells us, preparing the pâté takes some two to three days start to finish (no mean feat for a busy diplomat, we might add). “Pasztet,” a baked pâté both delicious and impressively labour intensive to make. Next to it is a seasoned, stuffed boiled egg. The time, care and complexity that went into the pâté is obvious in the taste, too. The flavours of meat, vegetable, and herb blend with and complement one another in every soft but firm mouthful, creating a perfectly harmonised whole. The liver is definitely present and accounted for, but nowhere near overwhelming. The herbs whisper their hints of freshness, the onion and carrot sooth with their rounded fullness, the entire experience of taste and texture a pleasure from palate to nose to grateful stomach. Paired with a dab of the white horseradish and cranberry sauce that are apparently fixtures on the Polish family table, and the pâté is taken to yet greater heights of flavourful complexity. Though I’d never tasted anything quite like this – any of this – before, both my tastebuds and my tummy took it all in easily and with relish – an effect perhaps typical, I think, of any world cuisine that has been cultivated, enhanced and shaped over many generations. The depth and fullness of the pâté has its parallel in the traditions and culture that brought it to the table. 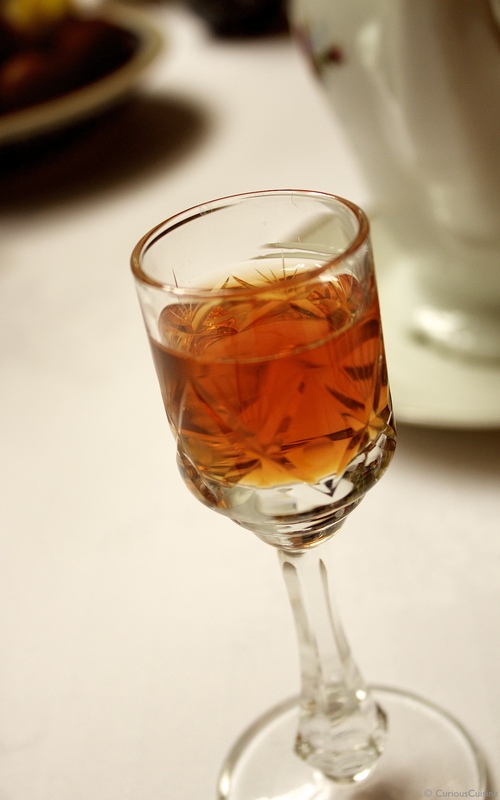 A glass of the sweet amber goodness that is Polish mead. Next: dessert, a special Easter confection called Mazurek. It starts with a broad sheet of cookie-like crunchy shortbread, rich with the flavour of browned butter. But it doesn’t stop there, oh no. The shortbread is overlaid with a small ocean of milky-sweet icing called Kajmak, which turns out to be what is called Dolce de Leche in many South American countries. A mixture of milk and sugar, it is slow-heated for hours until it reaches this silky consistency and caramel-brown colour. Dominika was apparently trying for something a little stiffer than what was on this day’s Mazurek, and is not entirely satisfied. We, however, have been transported. 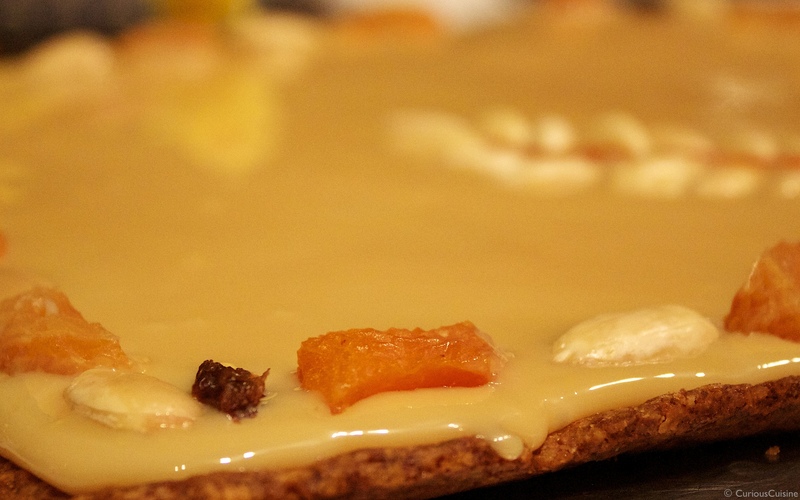 The browned butter aroma and satisfying crunch of the shortbread contrast wonderfully with the creamy smoothness of the Kajmak, while small chunks of dried apricot placed here and there on top of the icing make for delightfully tart little surprises. The balance of texture and flavour is impeccable, and incidentally is a perfect partner for the coffee served along with it. Polish families have been making these kinds of care- and labour-intensive dishes season after season, year after year, generation after generation, and we both find this commitment astounding. But then it’s not just culinary customs, but rather a whole range of traditions that Poles have so carefully and enthusiastically passed down through time. Many traditional rituals, practices and celebrations take time and effort, and their value and significance live within the individuals of each generation, making them vulnerable to changing attitudes, the passage of time or the trend to simplification and convenience. And while many traditions all over our world have slipped into the dark night of history in these ways, the Polish hold on to theirs; celebrate them, live them to the fullest, and we want to know why. 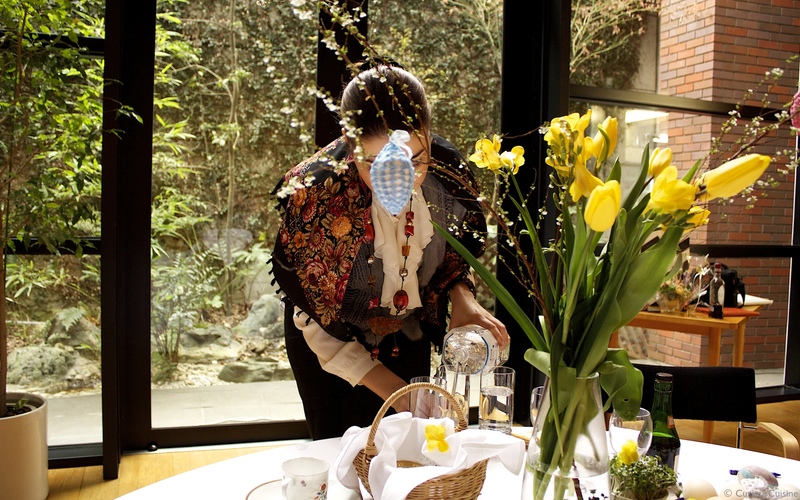 So, we ask, what does tradition mean to her? Home-cooked meals made with stunning love and care. Seasonal traditions with the family table as their touchstone. With so much emphasis on family custom, one might be tempted to think of Poland as a conservative place, but listening to Dominika it becomes clear “conservative” is the wrong way to put it. Rather, Poland loves culture, and important parts of that culture are given shape by tradition. Culture is part of identity, but it is also lived by many people in common, becoming a lingua Franca of experience that brings those people closer together. Perhaps that is what’s most striking about our talk with Dominika and our brief encounter with Polish Easter; not just that seasonal traditions give the year its tempo, but that they become stage to the shared joys of Poland’s culture, of the personal connections that give people’s lives meaning every day.